Flattop Mountain is a beautiful mountain located near Bear Lake in Rocky Mountain National Park. It features gradual, but strenuous gains, stunning views, and is a fantastic year round hike. The flattop mountain trail is the main trail to hike to the summit of Flattop Mountain. There are a couple variations that are common for hikers to take. The most common of which begins at Bear Lake. This route begins at the end of Bear Lake Road, an extremely popular area in Rocky Mountain National Park. During peak season, it is recommended to take the park’s shuttle to the trailhead. This trail begins along the bear lake trail encircling the lake where hikers will quickly bear right towards the Flattop Mountain trail and Lake Bierstadt. .5 miles after that right turn, hikers reach a junction in which they need to turn a hard left towards the Flattop Mountain Trail. A right turn will lead hikers towards Bierstadt lake (an alternate route up Flattop Mountain). 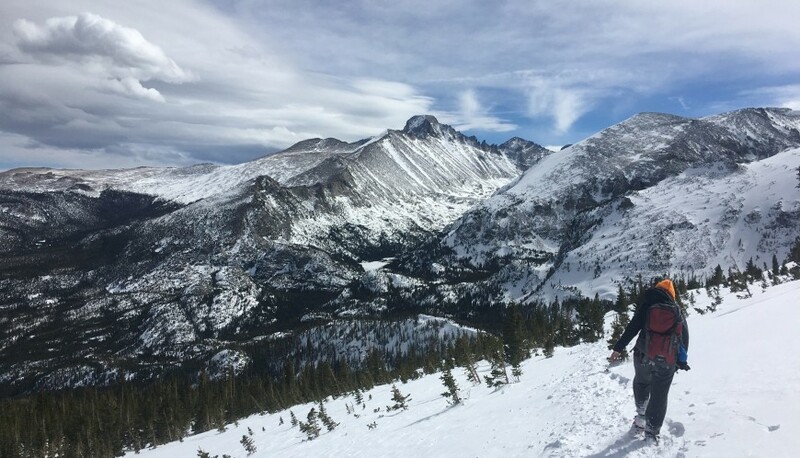 Once turning left, the trail begins to get gorgeous views of Bear Lake, Longs Peak, and much more. 1.7 miles into the hike (at around 10,500 feet), there is an overlook of Dream Lake. Treeline is reached around 2.4 miles into the hike. At mile three, hikers will reach the Emerald Lake Overlook, which is one of the most stunning viewpoints of the hike. The viewpoint sits roughly 1,200 feet above the lake, and features views of Hallet Peak, the lake down below, and a look at some steep incline soon to come. The rest of this hike is stunning at all moments with views in nearly all directions. The summit of Flattop Mountain (unmarked) is located at the trail junction 4.45 miles into the hike. Hikers have the choice to continue on to Hallet Peak with an additional .7 miles and about 400 feet of elevation gain as seen on the trail map. This trail begins at the Bierstadt Lake parking area. Hikers will ascend the Bierstadt Morraine to Lake Bierstadt in 1.2 miles, and then turn left towards Flattop Mountain. This option ads a bit of distance to the overall hike as well as elevation gain. This is a great option for those looking to add a little difficulty, or test out a new route, though much of the hike is the same. Flattop is a great winter hiking option due to its popularity, gradual incline, and stunning views. Microspikes or snowshoes are essential in most winter situations, with snowshoes being necessary dependent on snow conditions. The normal winter hiking precautions and gear should be taken.